Back in the middle of November, when everyone was frantically posting about Thanksgiving and Christmas, we threw a WILD surprise party for my sister-in-law, Kristin. Of course, I didn’t get a chance to blog about it then, but I thought you party-ers would like to see it. 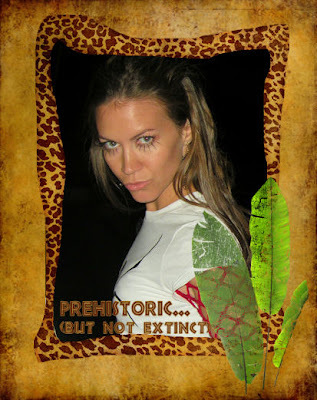 It was actually inspired by one of my finalist’s parties from my last Blogoversary: Jackaroo Love’s Prehistoric but not extinct party. Kristin was only turning 25 (not 40), but that is a quarter of a century old, and she has always had an affinity for animal print (she wore a zebra stripe dress to the prom–no lie! ), so it seemed perfect for this milestone celebration. I had some big ideas for invitations, but her generation rarely uses snail mail (or stays at the same address long enough to collect addresses), so we decided an evite would be most effective and appropriate. I was happy to find that I could customize my evite with our own photos and background. I was frustrated that it took a lot of trial and error to get it to look the way I wanted. I took this photo of her from Halloween and embellished it with elements from a wild Lisa Sisneros kit @ Little Dreamer Designs. So this is what guests saw when they opened their evite. She did the animal print all out of homemade fondant, which IMHO tastes much better than store bought fondant. And the cakes, themselves, were delicious–not from a box! Doesn’t is look great! What I was really proud about was how well I “shopped the house” for the occasion, instead of spending tons of money. The giant antler in front of the cake, has been hanging out in my garage for some time, irritating me. But I was so excited to find a purpose for it here. The brown satin tablecloths were made for my Chocolate-themed gourmet group dinner last year, and I had some candles from that event. I had small river rocks, at home and used them heavily. The bamboo container holding the utensils, came from a chopstick holder from Japan (hanging around the house), and the “serving trays” are just ceramic tiles. The smaller ones come from our patio table and are easily removed. The large one was a sample from a home we almost bought, and I just set it on top of my regular cake platter. I did find the fun votive holders and trays at Ross for pretty cheap (as well as some disposable bamboo plates), and gave them to my SIL as her present, after the party was over. I had the others collect anything animal print and/or furry and bring it to deck out the living room where people would be hanging out. We took the giraffe rug from Jackson’s Jungle room, to set off the table. We served some of her favorite fun foods like hummus with veggies and pita chips, but I think the meat skewers (not pictured above), were great and really went with the feel of the night. After the big surprise, Kristin was given a zebra striped hat (with a tiara, I think) to wear the rest of the evening and for pictures with all of her guest. It was a fun, WILD (ok, not really wild), time, and she was totally surprised! *Link up your favorite party(ties) from this past year. Yes, you can do more than one, but let’s not get too carried away. Maybe your top 3? *I will pick my favs as featured finalists, and then your vote will determine the winner. *Remember the winner will receive a $30 Gift Certificate to Paper & Cake, to help with all of their upcoming parties! Yea! *I am not necessarily looking for the most extravagant parties (feel free to post those, anyway). We can all drool over parties that cost tons of money and look picture perfect. I get most excited about parties that demonstrate creativity: A unique theme, an inexpensive way to get a high-impact result, an idea that I want to steal for a future party, something I get excited about for whatever reason–you get the picture. Link-up the parties you threw with a tiny budget that were still fun and interesting. *Please add a link to your post about this party (or add the button on the sidebar. I’ve updated the html), so others can join in the fun. *Try and visit other posters and encourage them in their party-throwing endeavors. We all know how much work it can be! OK. That about covers it! You can add your links through the weekend and into the beginning of next week. So even if you aren’t ready, come back and join in then! I hope you all enjoy the party! Looks like a super fun party and a great way to turn 25! I love the mixtures of textures, the rocks and wood are great additions. I missed last year's party. I found your blog fairly soon after when looking for Valentine ideas. Thanks for a year of inspiration? Thanks for hosting this cool party! Sorry I sumitted 8 parties…I didn't read very well! LOVE the party! It looks great! Go shawty, it's your birthday, we gonna to pawty like it's your birthday, we gonna sip Barcadi like it's your birthday…ok I'm stopping. Does that song every get old? Thanks for another year of fabulousness. This was so fun last year! Thanks for doing it again. Great way to get some wonderful ideas from everyone. Your parties are always wonderful and this one is to cute for words. The cake! I love the cake! That is SOME kind of party! You put the taped together banners and crepe paper streamers that seem to make it into our party decor to SHAME! I really have no business even being on this happenin' party blog, but I do LOVE a good zebra cake! I missed the party because we had a hideous day at the pediatrician's office! Aaack! And then the weekend hit…but I wanted to post, so I did late anyway! Happy Anniversary! That is an awesome theme for a party! I am having so much fun checking out all these great parties! I'm having a Party Link party too, care to link your party? This was fab post btw!! The festivities at my school was far from good, provided they were all boring and ugly. companies like Electronic Arts and Playdom that was recently obtained Disney. In previous occasions Anonymous has orchestrated attacks against websites using what are called ‘distributed denial of services attacks’. ” This corresponded to the time when the CIA was attacked.